I could tell you about the few off venue concerts that took place today. I could tell you about Ylja, My Bubbi and Mi, Samaris or Ósk. However, they were not the big news today at Airwaves. I usually don’t agree with the reduced schedule on the Sunday of Airwaves; it always seems like it is winding down too early, that the spirit of Airwaves disappeared for another year as soon as Gus Gus played their last beat. This year though, I was grateful. Why? Because it gave me a chance to enjoy the weather. In sharp contrast to the rest of the week, the weather has been gorgeous in Reykjavík today, with deep blue skies, sunshine (no, really!) and clear views in every direction. I used it to my advantage, taking long walks, snapping with my camera and dozing in hotpots at Sundhöllin. The second hot topic of conversation was, of course, Sigur Rós. There have been some concerns in the Sigur Rós camp recently; scrapped albums, touring line-up changes, and formal apologies to festival crowds. There was no need to worry though. Sigur Rós may have made us wait for over an hour, but delivered an excellent set. Songs came from all of their albums, and seemed not to favour Valtarí, their most recent album. Classics such as Hoppípolla and Glósoli got a hearing, as well as the now traditional set closer of Popplagið. The band played for around two hours, which is substantially longer than their recent shows, which may of been a mark of respect to their home crowd. The screens came down to reveal a embellished Sigur Rós line up; there is a brass and string section, additional musicians, and an army of lights and projectors. The back of the stage is taken up by one lengthy concave screen, on to which projections are shown; mainly of a watery theme – swimmers, bubbles, the Valtarí ship, sea creatures etc. even the laser lights are used to make wave-like movement over the heads of the crowd. There was a danger that the fantastic light shows and projections may have threatened to take some of the emphasis away from the music itself, and a small part of me was pleased to when a box showing the error message ‘no signal’ momentarily flashed up on the giant screen. I needn’t have worried though, a startling performance of svefn-g-englar showed the power of music and visual effects working together. Jonsi seems to have taken some of the ideas from his solo set with 59 productions and ran with them. I could without seeing that eerie looking doll again though. The best is yet to come. Sigur Rós played a new song in their encore, and what a beast it was. Called Brennistein, it starts with a bass line that sounds like a science-fiction creature searching for prey, it’s a juggernaut of a song with an attention catching first half, and a delicious, thoughtful finish. It sounds like a song from a movie that plays in your head, and this just be the best song I’ve heard at Airwaves this year. 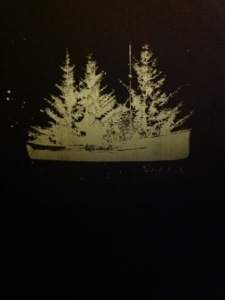 Sigur Rós then, have delivered a headline show that was of top quality and pushed the rest of Airwaves brusquely aside. On the way out, I get a text message from am Icelandic friend – ’New Sigur Rós album next year’ it says. On the strength of their performance tonight, I can’t wait. Limited t-shirt from concert at Airwaves.